"Black Scots" redirects here. For black people in Scotland, see Black people in Scotland. "Native English" redirects here. For different meanings for English, see English. A 19th century community of the Métis people of Canada, the Anglo-Métis, more commonly known as Countryborn, were children of fur traders; they typically had Scots (Orcadian, mainland Scottish), or English fathers and Aboriginal mothers. Their first languages were generally those of their mothers: Cree, Saulteaux, Assiniboine, etc. and English. Some of their fathers spoke Gaelic or Scots, leading to the development of the creole language known as "Bungee". Forming communities in the Red River and the Saskatchewan valleys, they initially had fewer problems with the expansion of the Canadian state westward during the 19th century than did their francophone cousins. They tended to identify more with the politically and economically dominant British culture of Canada at this time. Additionally, the Anglo-Métis / Countryborn had a more sedentary lifestyle of farming than the francophone Métis community, whose men were generally hunters and trappers. The French-speaking Métis were somewhat more nomadic, due to their reliance upon hunting as a trade and food resource. The Countryborn played a role in both the Red River Rebellion (or "Red River Uprising") of 1869 and the Northwest Rebellion (or "Northwest Uprising") of 1885, as they suffered from similar issues of racial discrimination and land problems as their francophone brethren. By the 19th century the English-speaking and French-speaking Métis had become culturally quite similar, moving closer to each other in opposition to the British-Canadian majority. Their musical traditions, especially in the case of fiddle music, was derived from both British Isles and French origins, as was the Métis traditional dance referred to as "jigging", or the "Red River Jig". In complexion they ranged from fair skinned, blond and blue eyed through dark skinned, with dark hair and dark eyes. Métis elders say that no distinctions were made between individuals based upon complexion within the community. Family, culture, and strong identification with their Christian faith were the unifying bond amongst them. The two communities' primary differences lay in their languages and Christian religious affiliations; the French speakers were generally Roman Catholic and those of British descent were Protestant. Most Countryborn were Anglican or Presbyterian. They were involved in a mixed economy of subsistence farming and bison hunting throughout most of the 19th century; they also found employment with the Hudson's Bay Company and the North West Company. The Countryborn were often known in the 19th century as "mixed-bloods", "Black Scots", "Native English" or "halfbreeds" (a term now considered pejorative). 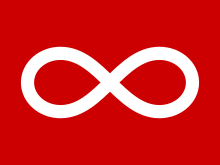 The French-speaking Metis referred to them simply as les métis anglais or les autres métis. Anglo-Metis gradually came to see themselves as little different from the French-speaking Métis. Today, the two groups are no longer politically distinct, and are commonly known on the Canadian Prairies simply as Métis. Prominent Anglo-Métis / Countryborn include James Isbister, Thomas McKay and John Norquay, the Premier of Manitoba from 1878 to 1887. Oral histories of Manitoba and Saskatchewan Metis/Michif Elders.